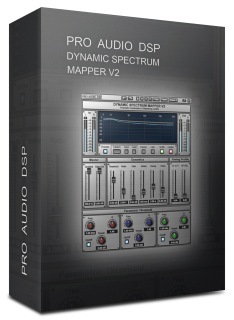 Dynamic Spectrum Mapper v2, Other software dynamics processor from Pro Audio DSP. Plugin Alliance welcomes Pro Audio DSP as its latest Alliance partner company, coinciding with the release of the latter’s Dynamic Spectrum Mapper V2, plus two new plug-ins from Brainworx. 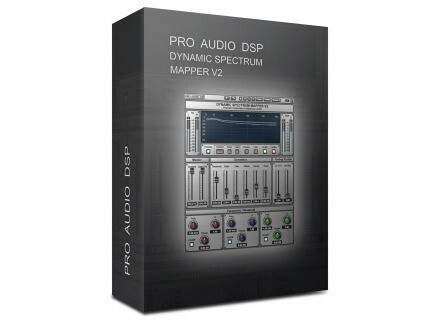 Billed as being a Prismatic Compressor & Metering Limiter, Dynamic Spectrum Mapper V2 features a one-click ‘capture’ system which is designed to capture both the frequency domain and dynamic characteristics any audio material, then deploy this as the basis for a multi-band compression process. Sonic character can be mapped between mixes, tracks, vocal parts, and instruments. DSM V2 can also serve as a de-esser or vocal enhancer and compressor. Brainworx’s bx_limiter is a limiter plug-in designed to help determine how many dB of dynamics to reserve for every single signal. Users can create more space and dynamic range for the overall mix by limiting individual signals such as kick drums, snares, lead vocals, and bass. The Wet/Dry control can pull up vocal details in mixes, control bass sounds, and more. bx_XL V2 is based upon the M/S technology taken from Brainworx’s bx_digital, a ‘modern classic’ analogue M/S EQ developed in 2006/7 and available as a plug-in. As an M/S stereo mastering limiter plug-in, bx_XL V2 internally converts stereo signals into M (mid/sum) and S (side/difference) signals, splitting the M channel into high and low bands; limiting and leveling those three channels individually increases loudness and is designed to improve clarity of stereo mixes. spacedad Dirtylay Spacedad has released Dirtylay, a 32-bit VST Delay Effect for Windows. Ohm Studio Delayed Ohm Force has announced that, after 7 months of Open Beta, Ohm Studio is now planned for release in January 2013. IK Multimedia Ships iRig KEYS IK Multimedia announces that iRig KEYS is now shipping.